This feature is in pre-production. Contribute to the in-progress spec here. High school algebra is the gateway to mathematics and all other disciplines of STEM. However, algebra is the single most failed course in high school, as well as the most failed course in community college (Washington Post). Graphing capabilities in their daily tools are essential for students who are beginning to explore linear algebra as early as 8th grade. Physical graphing calculators can be expensive, software solutions require licenses and configuration by school IT departments, and online solutions are not always an option. At present, Windows Calculator does not currently have the needed functionality to meet the demands of students. Graphing Calculator is also the top requested feature in Feedback Hub. Empower students to learn mathematics by improving conceptual understanding and attitudes towards math by adding graphing support to Windows Calculator targeting grades 8-12 students and teachers (math/physics). With graphing calculator, we can improve learning outcomes of students by increasing engagement and visualization of math equations. I have no direct stake in this, but I like my calculators relatively simple. Something I can count on. I've seen #209 filed already and I can only imagine adding such feature would only make it worse. When I encounter a graphing calculator, I expect much more from it than from a non-graphic one, some of that is already encapsulated in the "goals" part of this ticket, but I imagine the engine part of the calculator would have to grow significantly (see references). Are there more specific issues going to be filed against that? How is it going to be implemented now that calculator is open sourced, is it going to be a feature delivered by MS or rely on the broader open source community? If former (as #339 would have me thinking), is it going to be developed in the open or is one giant PR suddenly going to appear one day? I'm quite curious. This is your friendly Microsoft Issue Bot. I've seen this issue come in and have gone to tell a human about it. It seems important to be able to export or share calculations and graphs in a way that's interoperable with other mathematical applications. 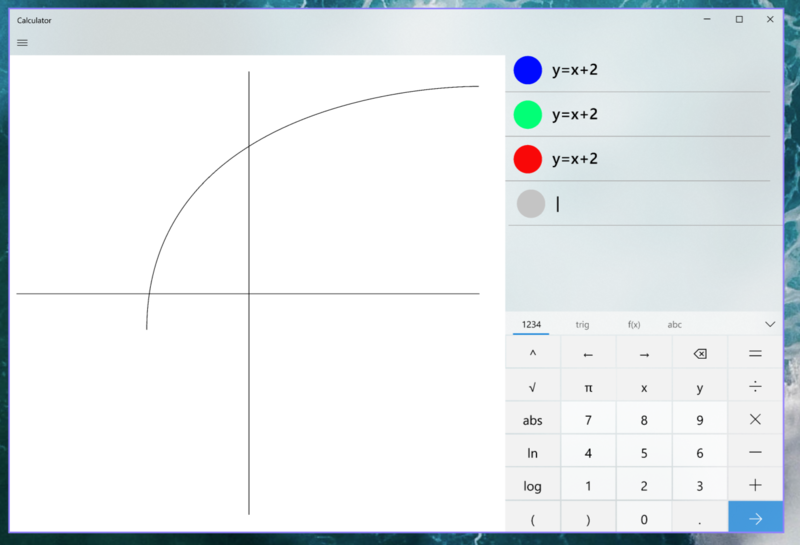 That way, we can feel confident using Windows Calculator as a lightweight tool for quick explorations (hope you can hold the line on startup time! ), and not worry about hitting a "dead end" if I end up needing more advanced features. If former (as #339 would have me thinking), is it going to be developed in the open or is one giant PR suddenly going to appear one day? I'm quite curious. @janisozaur - We have been doing various forms of prototyping and then initial ground work on this for about a year now. Within the next week or so, you should be seeing the initial PR for populating the feature branch. The feature is not done, and we are looking for community involvement/participation in the completion of the feature. But yes, there will be a large PR to initially populate the feature branch. but I imagine the engine part of the calculator would have to grow significantly (see references). Are there more specific issues going to be filed against that? There will be more information included in our documentation when that feature branch is created, but the abbreviated version of it is that we are not developing the graphing engine ourselves. We will be using one developed elsewhere, and it unfortunately has restrictive licensing. Therefore, the engine will not be included in this repo, only the interfaces that we use to interact with it, along with a mock implementation so that the developer build will continue to function. So, our development efforts on this feature will be focused on developing a great end-user experience as opposed to the development of the engine itself. About time! Add even more features. I would like to see the entire set of TI-85 features added to Windows Calculator. Bring graphing functionality to everyone in the world! Also, bring back Windows Phone! Yes, there are free programs out there. However, Microsoft Math is not in the windows store and not on the Windows Universal Framework so it will not run on Windows Light and will not run on Windows Phone. There is a bug on a screenshot in "Low-Fidelity Concept". Initial PR for the feature/GraphingCalculator feature branch, part of #338. The feature incorporates a proprietary Microsoft-owned graphing engine to drive graphing experiences in the Windows Calculator app. Due to the private nature of the graphing engine, the source available in the public repo will make use of a mock graphing engine. See README.md for more details. This PR simply serves as a base for future feature development. As such, the PR will be immediately merged. Feedback on the content of this PR, and on the feature in general, is encouraged. If there is feedback related to the content of this specific PR, please leave comments on the PR page. We will address the comments in future PRs to the feature branch. Feature development for this issue will occur in the feature/GraphingCalculator branch. See 091732a for the intial commit.